1. Designing a unique product for 3D printing can be tricky for 10 and 11 year olds. Students had to identify a problem and then create something using SketchUp to solve their problem. Ideas ranged from pencil holders to earbud organizers to knitting needle guides. Creativity wasn’t an issue with my students. What was more challenging was using the software to actually design their products. I observed many students having to simplify their designs or make changes based on their comfort level with the program. Expert users did emerge in each of my 8 classes and they were eager to help their classmates as needed. I must explore other 3D modeling programs that may be simpler to use or more appropriate for my elementary students. Maybe just spending more time exploring within SketchUp is needed to truly grasp the tools. In the very least, I will revisit the expectations for both grade levels and determine if adjustments should be made based on the student feedback I received. 2. 3D Design and printing takes a long time from start to finish. Because I only see my students biweekly, the challenge was getting each of them to complete a design and then print it within a timely manner. The first steps in the process, identifying a problem and brainstorming ideas, took one class period of 60 minutes to complete. The next step of actually designing the product using the 3D modeling software took another one or two class sessions to complete (60-120 minutes). I worked with approximately 180 students on this project and most of them didn’t actually see their own concept being printed. This is because their projects often took two to three hours to print! On a good day, I could print three or four designs. Sometimes, I was lucky if one finished before the end of the school day. Needless to say, I had to develop a system for printing (save files by student name/color choice, group colors together on SD cards, have multiple SD cards available for saving/printing) and even then I didn’t finish everyone’s prints. It didn’t help that the printer wasn’t working for several weeks. I truly felt I failed the students who didn’t leave with their tangible product. Next year, one of two things must happen: students’ creations will either have to fit a specific size criteria before printing or we start earlier in the school year to allow more time for printing. 3. The 3D design challenge is real-world application of skills at its best. By combining problem solving with project based learning, students used logical, spatial, design thinking and math skills to develop their products. Students were engrossed in this project! From the moment I set up the 3D printer in the tech lab, students wanted to print something, anything. When I posed the design challenge to these fourth and fifth graders, every single one of them tried their very best to design a cool, yet useful, product. They manipulated shapes on a plane to get their design just right. They measured their designs using millimeters, centimeters, and/or inches using the virtual tape measure. They scaled their designs up or down. Some had to go back into the program and revisit the measurements if they had a “design flaw.” I was so impressed with their determination to get their designs just right and I think it was because it truly meant something to them. 4. One must not be afraid of the 3D printer. The filament jammed in the extruder. I had to take the extruder motor apart on several occasions and now can do it without asking for help from MakerBot Support. I know that the telltale “clicking” requires me to unload the filament and remove whatever is jammed in the motor. You can’t be leery about this task as it is very common and happened weekly during our design challenge. Humidity caused havoc with filament. I work in a 100-year-old building in a lab with no air conditioning. The least bit of humidity in the air causes the filament to swell and not work through the extruder. After realizing this, I had to adjust my printing schedule around the weather. I’d get to school super early just to get a print started before the change in the tech lab environment stopped our production. Maybe winter and spring in New England is the best time for 3D printing! The thermal barrier tube became blocked. This was a bit trickier to fix than the simple filament jam. After unsuccessfully trying to clear the blockage, I actually had to request a replacement part. This presented us with an unforeseen delay in printing. Prints weren’t printing correctly on the build plate or were difficult to remove. Blue painters tape is a 3D printer’s best friend. The full sheets of tape are great but a roll of 2-inch tape works just fine too for covering the build plate and making prints easier to remove. I would also suggest getting a putty knife or similar tool for aiding in the removal of the prints. I learned rather quickly to set all designs to print with a raft as well. It is super important that you take the time to level the build plate at least daily; maybe even after each print. All of these things will help with the final prints. One of the plastic pulleys and belt wore out and needed to be replaced. This was very challenging to fix. Although MakerBot was great about sending me the X-axis belt, gantry bracket, idler pulley, dowel pin, and PTFE grease needed to fix the problem, it was hard to do! It turned into a two-person job with help from my building’s custodian. I can only suggest keeping up with regular maintenance in hopes of not running into this same problem. It took me several days to fix! The printer made a dreadfully loud noise when the extruder went to its “home” position. This issue was apparently caused by a glitch with the stop end cable. Although not as difficult as the pulley and belt replacement, this fix scared me the most! I actually had to deal with the motherboard and feeding the cables through the machine and making sure everything was attached correctly. It doesn’t sound like much but it sure did intimidate me initially! You may have a district computer technician who you can rely on when something needs to be fixed with your printer. I would suggest checking your district’s policy on this prior to getting a 3D printer. This way you’ll know if you’re on your own or not. If you are, like I was, don’t hesitate to reach out to the support team to help guide you through whatever issues arise. 5. 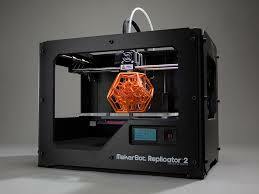 The benefits of 3D printing far outweigh any potential problems! There are so many awesome reasons to try 3D printing with your students. The levels of enthusiasm and engagement as well as the multitude of skills used by my students during the process were exciting to observe. The daily collaboration among students and the way they could view me as a learner too were results I hadn’t anticipated. The pure joy and pride on each student’s face as I took their picture with their completed design was priceless. My students became designers and makers and were super proud of themselves! This entry was posted on July 2, 2015 at 10:18 am and is filed under Technology in the Classroom. You can follow any responses to this entry through the RSS 2.0 feed. You can leave a response, or trackback from your own site.